So far, high prices and barriers to entry have made solar most accessible to well-to-do homeowners and corporations. Assessing the possibilities of policies and business models, the report, which also received support from the Coalition for Community Solar Access and Grid Alternatives, notes that community solar installations could reach a total of 84 gigawatts of operating capacity, serve 8.8 million customers and account for as much as 2.6 percent of U.S. electricity consumption by 2030. Current community solar capacity through Q1 2018 sits at just below 1 gigawatt, a little less than 2 percent of overall installed solar capacity in the U.S. But a look back at the past eight years shows the market is just beginning to take off. Because community solar uses a subscription model and doesn’t require the space for an installation on site at the user's residence, it’s theoretically more accessible. Between 2016 and 2017, installed capacity more than doubled. But several barriers, many involving the process of signing up participants, continue to constrain the sector. Development of a community solar project looks much like any other commercial or utility-scale project, and difficulties with customer acquisition echo those that have challenged the solar industry at large. Community solar often requires fewer steps for signing up subscribers than do other projects, but Shiao noted that “customer acquisition is a sticky problem” in all solar sectors. That’s in part because community solar was designed to be flexible for users, but the administrative infrastructure used in the solar industry is the opposite. Most power-purchase agreements last for a decade or longer. The majority of community solar contracts are no exception, according to Solstice, an organization that partners with community solar developers on customer experience. Solstice co-founder and CEO Steph Speirs said most contracts last for 20 to 25 years, a timeline that doesn’t match modern customer needs. Shiao said those signing on to community programs may not be thinking on a 25-year project timeline in the same way that homeowners looking to invest in residential solar probably are. “If you’re thinking about community solar and trying to target renters, well, renters...[are] not necessarily sure that they’re going to stay in their apartment, or wherever they’re renting, long-term,” he said. Solstice is trying to change the standard by sharing its customer data with developers. The company's data indicates consumers are less likely to sign on to projects that have cancellation fees or long-duration contracts. Those conditions narrow the subscription base available to a project, which ultimately means customer-acquisition costs increase. Speirs expects customer demand to eventually compel change in contract structure. The organization has already noticed smaller developers offering shorter contracts without cancellations fees, which should nudge bigger players in that direction. Credit scoring represents another challenge for community solar subscribers and especially low-income customers, according to Speirs. Many developers require subscribers to have an excellent FICO score, above 650 or even 700 according to Solstice. That’s a high barrier for many customers, and Speirs believes it's an inaccurate predictor of whether a subscriber can keep up with contracted payments. Solstice’s EnergyScore, a qualification metric developed with the support of a Department of Energy grant, aims to more accurately predict whether a customer can pay a subscription using demographic data. After analyzing 875,000 customer records to measure the correlation between utility delinquency payments and FICO scores, the company said its metric is 40 percentage points more accurate than FICO at predicting whether a customer will pay. It's also 11 percent more inclusive of low-income households. According to GTM Research, 31 million low-income households and 5.78 million affordable housing properties could benefit from community solar-related energy savings. Eventually, Shiao said it’s possible developers will actually consider community solar projects less financially risky than others because there’s an entire roster of responsible parties rather than just one. “It’s maybe a little more diverse than looking at one specific, big offtaker and betting the farm on one offtaker,” he said. So far, state policies have mostly determined where developers can actually pursue community solar projects. According to GTM Research, 42 states plus Washington, D.C. currently have some type of community solar program in place. But the great majority are one-off programs sponsored by utilities. 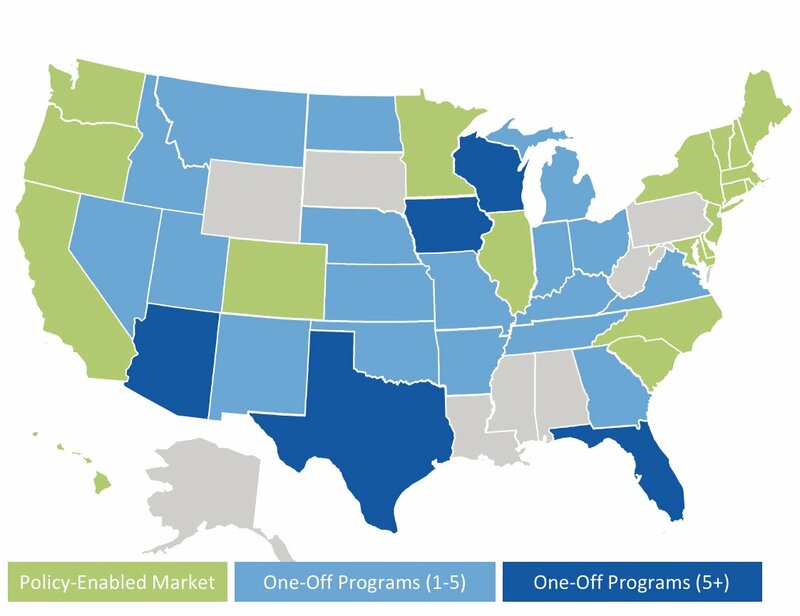 Only 19 states have policy-enabled community solar markets, accounting for 71 percent of currently operating capacity. Whether more states put supportive policies in place will likely be the most important factor in determining the sector’s success. Solstice currently works in Massachusetts and New York, but it’s in contract negotiations to move into other budding markets next year including California, Minnesota, Illinois, Maryland and Rhode Island. Speirs points to Colorado, a state once at the vanguard of community solar, as an example of policy struggles squeezing installations. The market in Colorado is now capped by three-year planning timelines and hinges on bidding on renewable energy credit value, which at times has gone into negative values. Whether or not a state has established virtual net-metering policies isn’t the only factor in a state’s success. Speirs noted how states treat commercial versus residential entities, whether policies include a low-income adder or a carve-out, and how utilities embrace change can all shape a state market as well. In the last year, Speirs said Solstice has noticed an uptick in inquiries from utilities wanting to learn how to structure community solar programs. That’s a possible barometer of success. Utility interest indicates attitudes about community solar are changing, not only among risk-averse power companies, but among their customers as well. In addition to passing legislation that establishes a community solar market, GTM Research analysts note the need to focus on “stable, fair rates and market participation structures” in state policy. Analysts recommend job training programs, siting preferences and community-focused incentives to provide benefits to populations that have been sidelined by the electricity system. Baking environmental justice initiatives into community solar development can also have positive impacts on public health. According to Shiao, another indicator of good state policy is on customers' bills. He said the bill-crediting mechanisms that states and utilities use are “kind of all over the map,” literally and metaphorically. A lack of transparency in how credits work, or if they arrive late or are inaccurately calculated, can turn customers away. Though GTM Research doesn’t recommend a specific policy or program to credit customers, Shiao said the approach used does need to be clear to subscribers. Should states embrace supportive policies that boost the sector, analysts forecast that by 2030 community solar capacity will account for at least 1.7 percent and up to 2.6 percent of total electricity generation in the U.S. It will also bring in $81 billion to $120 billion in investments. 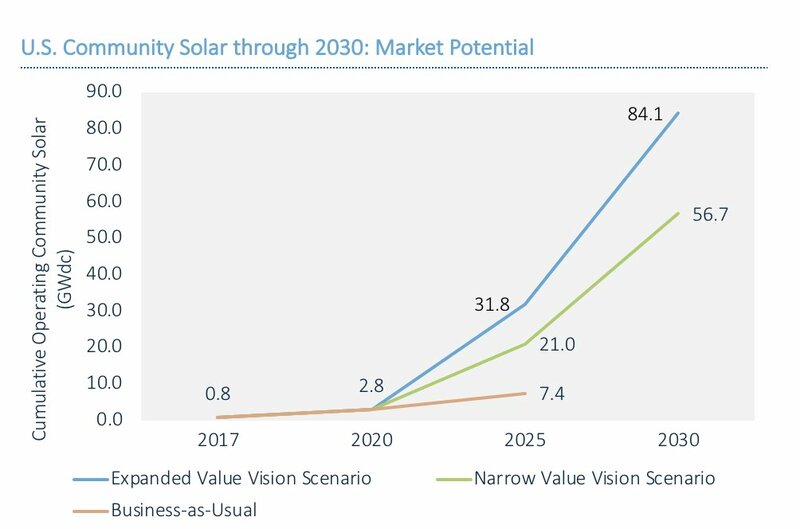 GTM Research’s most ambitious 2030 forecast shows that community solar will only cover 8.8 million of the 75 million to 113 million households and businesses without access to onsite solar. But better policies would help lower the barrier to entry for the millions of Americans currently locked out of the solar industry.